Depending on where you start your yourney, it will take you about 11-14h from (South-) Germany, Austria and Switzerland. In and outside of Barcelona you will find a well-developed transportation system. The Cercanias are trains which are connecting the surrounding suburbs with the city centre of Barcelona.They leave in 20 minute intervals from the station Sants to the airport El Prat and are ideal for day trips in the surroundings of Barcelona. The Regionales connect different provinces and regions of Spain. 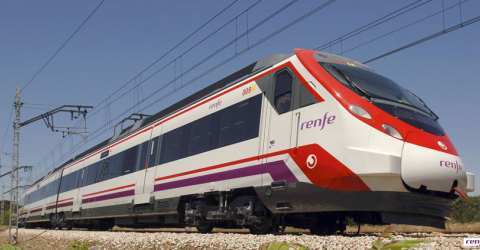 In Catalonia itself, the train connection is very well developed and prices are favourable. Grandes Lineas combine the largest and most important cities in Spain. These trains are slightly more expensive than the Regionales, but also faster. However, they do not stop at every station. The long-distance trains meet mostly in Sants station. From here, you go on easily by metro and bus. Schedules are clearly visible. Further stations are Plaça Catalunya, Plaça Espanya, Passeig de Gràcia, Estació de França, El Clot Arago. If you arrive from outside Spain, you can purchase the train ticket directly from your railway. The Barcelona Card offers free public transport and many discounts in the urban area of ​​Barcelona. Please, enter the desired number of Barcelona Cards and choose the shipping method. The Barcelona Cards are valid for 72, 96 or 120 hours starting at first usage. With the Barcelona Card Express you have free travel for 48 hours with the public means of transport and attractions at sights. With the Hola BCN ticket you have free travel on public transport trams, buses, metro and more in the city of Barcelona. The ticket is available for 48, 72, 96 and 120 hours. Please enter the desired number of Hola BCN! tickets (multi-day tickets for public transport) or Barcelona Cards. The Hola BCN! and many other services are included in the Barcelona Cards. Save money: Free and discounted admission, free use of public transport. Discover Barcelona with the double-decker bus. Hop on and off whenever you want. A ticket for six of the most important museums. Free admission without queuing. Behind the scenes of the FC Barcelona: tour through the stadium and admission to the Barça museum. Book a guided tour through Sagrada Familia. Inclusive tickets and admission without queuing. Learn more during a sightseeing tour in English. Private or in a public group. With the multi day Hola BCN ticket you can use the metro, busses and trams in Barcelona and to the airport for free. Fridays Jazz and Blues concerts at MEAM. Inclusive admission to the museum.